COLUMBIA, Mo 3/14/18 (Op Ed) -- A Facebook photo a Democratic Missouri State Representative posted of herself and the woman with whom Republican Governor Eric Greitens had an affair is another strange turn in the scandal swallowing his administration. 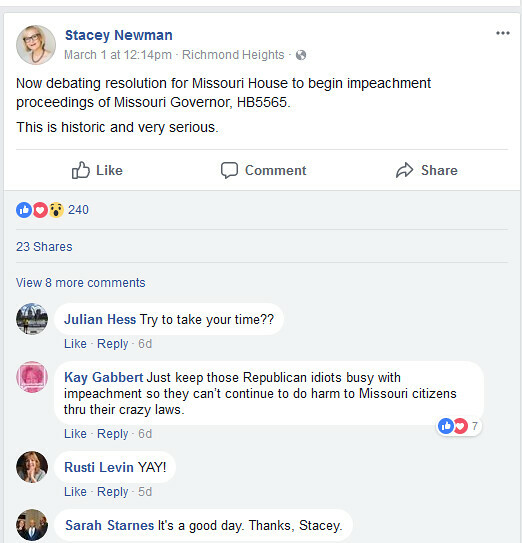 Rep. Stacey Newman (D-87), who posted the photo (below), is a vocal Greitens adversary who insists on the same Facebook page that his "impeachment has begun." 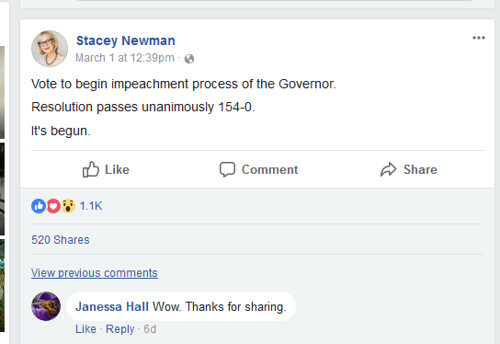 Two years after the March 2015 enounter, which included a blackmail allegation the Governor has denied, Newman introduced "my longtime family hairdresser Kitty Sneed, who as a new activist...is touring the State Capitol for the first time." Katrina "Kitty" Sneed was also Greitens' hairdresser. The St. Charles resident and ex-husband Philip were publicly outed as the couple at the center of the Greitens scandal by St. Louis-area shock jock Bob Romanik. Philip Sneed's attorney, Al Watkins, called their identities "the worst-kept secret in North America" at a recent press conference. 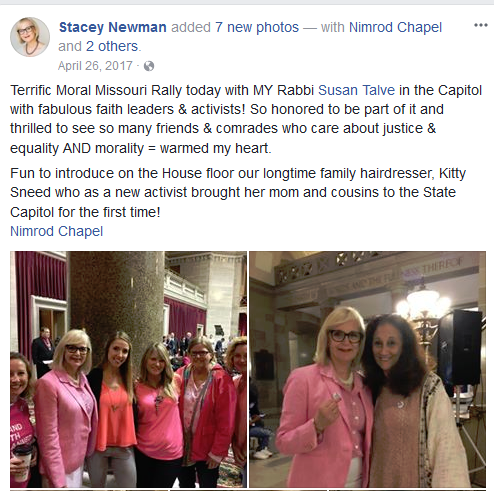 Newman represents a district next door to the Governor's St. Louis home, and both politicians have longtime connections to that city's close-knit Jewish community. Polar political opposites, the Governor and the Representative may be St. Louis' most powerful political pairing. But sixty three to his forty three, Newman has the edge, with a generation of savvy, experience, and political currency over her embattled rival. Newman did not respond to requests for comment and both Sneeds have repeatedly declined on-the-record media interviews. A felony indictment of Greitens alleges his encounter with Katrina Sneed ("K.S.") occurred "on or around March 21, 2015." His Gubernatorial ambitions were in full swing by then. "I’m looking at...Governor or Lieutenant Governor," Greitens told The Washington Free Beacon, for a Feb. 19, 2015 feature, "The Great Jewish Hope." The once-lifetime Democrat "will run as a Republican," the story noted. By Feb. 24, the "Jewish Navy Seal" had formed an exploratory committee that raised four hundred thousand dollars in five weeks. A Feb. 26, 2015 KMOX St. Louis story about the "Truman Scholar and Rhodes Scholar" included a prescient observation. “No matter what kinds of things Greitens has accomplished, he’s wandering into an area where there are lots of technical skills connected to casting candidates in a negative light," said University of Missouri, St. Louis political science professor Dave Robertson. Three weeks before the affair, the handsome young man with the urgent blue eyes had become the toast of Missouri politics. He was the courageous warrior with a story he'd published several times, stepping up for average, hardworking Missourians. By March 11, 2015 Greitens was taking on the Ferguson disaster, "with a few ideas of his own to build back trust between residents and those in power." "One of the most intriguing and promising candidates that Missouri voters in general, and Republicans in specific, have come across in years," Arthur Lieber opined on March 18, 2015. "He has a resume that is the envy of anyone, particularly someone who wanted to run for political office." Nine days after the date on the indictment, Greitens was the toast of Jewish Missouri politics, too. His campaign burning bright, Greitens blasted the political party he once called his own. "I was raised a Democrat," he told Fox News in July 2015. "I registered to vote as a Democrat...Democrats even tried to recruit me to run for Congress," he explained. "But there was one rather large problem...I no longer believed...I had concluded that liberals aren’t just wrong...often they are world-class hypocrites. They talk a great game...but their ideas don’t work, and often hurt the people they claim to help." "Many Missouri Democrats have been wondering about Eric Greitens," the Daily Kos reported days after his political conversion. "Some people thought he could be a reasonable choice for U.S. Congress, or Governor, on the Democratic ticket. But he has now made it clear. "He rejects the Democratic Party." Not shy about calling out her political enemies, Stacey Newman did just that in a June 2017 op-ed accusing Greitens of using religion for politics. 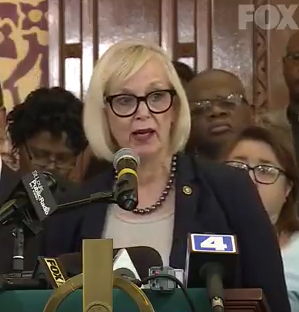 To repeal a St. Louis reproductive rights ordinance and pass religious protections for pregnancy centers, Greitens asked a St. Charles audience to pray, before a special legislative session Newman called "unprecedented, frivolous, and extreme." She broached the faith they share in the next paragraph. "When Gov. Greitens publicly applauds himself as a Reform Jew, shouldn’t he be held accountable to that faith -- or denounce his beliefs?" Newman asked. Greitens was doing to Reform Jews what he had done to Democrats: making "a complete 360-degree turn of philosophy. So who is he?" Her conclusion: a man at war with women, hiding behind dark money and a disingenuous identity. Religion separated the rivals again, after vandals roughed up a Jewish cemetery in University City. Greitens rallied cleanup crews in a Feb. 2017 Facebook post, posed for photo-ops, and hit a public relations jackpot when Vice President Mike Pence showed up to help. Newman -- who has relatives buried at the cemetery, Chesed Shel Emeth -- was not amused. "Our Governor has a responsibility. Not just on these Jewish attacks...but everything else,” she said. A "mom-turned-activist" well-known for her passionate, progressive voice, Newman has represented her St. Louis district since November 2009. Her political score card couldn't be more different than Eric Greitens', from leading the fight against Missouri’s conceal/carry law to championing women’s reproductive rights with a dash of faux extremism. Newman proposed a bill banning male vasectomies, an eye-catching way to illustrate that only women have to worry about family planning, illegal abortions, and the question of choice. "Vasectomies will be legal and safe, and the back-alley ballsnipper that so many indigent men are forced to seek when they want to get their junk switched off will become a thing of the past," RiverFront Times columnist Paul Friswold satirized. Newman came to politics the old-fashioned way: deeply and personally. "Kids and guns" prompted her daughter Sophie, then just seven, to write to Rosie O’Donnell. It was shortly after Columbine, when the nation was in terrific grief over an unimaginable tragedy. O'Donnell invited Sophie onto her talk show. "We were not particularly a political family," Newman told Boom Magazine, a St. Louis-based LGBT news and advocacy publication. "To hear our child talk so eloquently about the fear...totally changed our family’s world." Newman tackled her legislative agenda with the commitment of a "citizen lobbyist," she told Boom. "Reproductive attacks and gun rights are a political agenda that conservative Republican majorities are using throughout the country," she said. "It makes me extremely angry...It's real people’s lives we’re dealing with. That’s what bothers me the most...they don’t care that it’s affecting people." Right-to-Life groups and the NRA weren't only anathema to Newman's politics -- they were reprehensible to her faith. "I was talking to Ray Hartman [Riverfront Times founder] who reminded me that as a Reformed Jew, my religion says it’s up to the woman," she continued. "Does that mean your religion, if you happen to believe differently, trumps mine?" Newman puts her experience and connections to work for progressive politics' next generation, too. 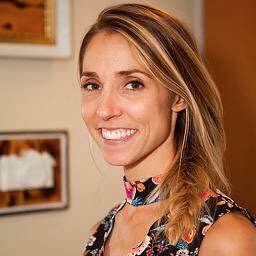 She recently endorsed her successor -- Ian Mackey -- a young, fresh-faced attorney who worked in the St. Louis Circuit Attorney's office that indicted Greitens, and who couldn't be more different than the Governor. 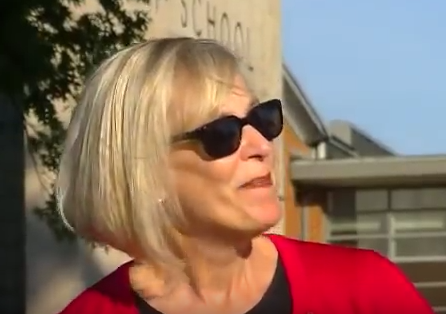 "We must all work together to elect the right leaders...finding good candidates to run...and then working hard to get them elected," Newman told Boom Magazine. "You’re seeing the younger generations, where equality is a no brainer," she said. "As we see younger people getting elected...who are not in their fifties or sixties...It’s a no brainer. That to me is the key..."
Which raises an interesting question: Did Stacey Newman ever see anything worth mentoring in young Eric Greitens, the Democrat, who would spurn her party with political slander, and in her mind, reject tenets of the faith they share? If so, how did he respond? Or did he even notice? Greitens at times seems unaware, oblivious. Too caught up in his own celebrity, maybe. Blinded by the light of his rising star. Not paying attention to subtle developments at critical moments. "Stacey Newman, you got a great big pair of brass balls," Paul Friswold wrote. "Never change."